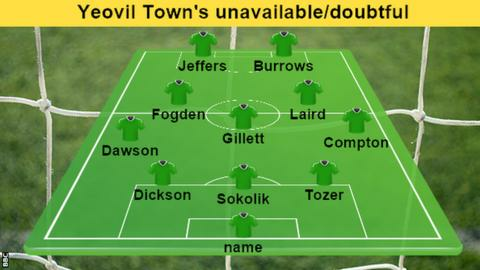 Yeovil Town manager Paul Sturrock says he will struggle to fill the substitute bench this weekend as an injury crisis threatens to derail their season. Sturrock has nearly an entire team of injured players with 10 of his first-team squad doubtful for Saturday's League Two game against Wimbledon. To add to his woes forward Shaun Jeffers is also suspended following last weekend's red card. "We've just got to battle through these next two games," said Sturrock. Winger Jack Compton has also been ruled out for four weeks leaving Sturrock little choice but to ask some of his squad to play despite carrying knocks. "I won't be able to fill it so I'll bring in one of the youth players to sit on the bench in a position we don't have many players for," Sturrock told BBC Radio Bristol. "Jordan Gibbons is playing with an injury but he'll have to play again. It's not ideal but that is the situation we are in. "It's quite scary when you look at the age of certain players playing every week. They deserve the experienced players to come back as quickly as possible. "They are getting match practice and learning their trade but they are making mistakes and really we need to get a more solid team on the pitch."